I had great expectations of getting together a great decent preview post for today, but for many reasons, it never got off the ground. Thankfully, some of my fellow cohorts came through in true blogger fashion. As usual, MGoBlog breaks down the game with a preview and Ace drops a FFFF. MZone does Know Your Foe. BWS does likewise. And MVictors breaks down yesterday's Hoke presser. In case you didn't already, follow me on Twitter as that's where I am during games. Also while you're at it, follow me on Facebook, too. Here's what we're playing for. We're actually playing for much more than that, but the trophy is a nice bonus. There's been some banter back and forth about how big of a game this is for Michigan. Does a win here signify that Michigan is "back"? Or does a loss set this program back at all? My answer to both questions is a resounding "maybe". I mean, Michigan won 10 games this year. They beat Notre Dame, beat Ohio, won 8 games at home, got to a BCS bowl, and Brady Hoke and Co. have put together a top 5 recruiting class. In my mind, this year is already a success, win or lose. Sure, a loss in a bowl game doesn't feel good, just ask most B1G teams. And a win would feel great, but it certainly doesn't mean that the program is back. Were we ever gone? Does the Michigan name endure a rough stretch of 3 years of ineptitude? I think so. Especially with direction the program is headed right now. A bowl is a weird thing in that it's sort of a litmus test as where you are in terms of being able to hang with a similarly ranked team from another conference. 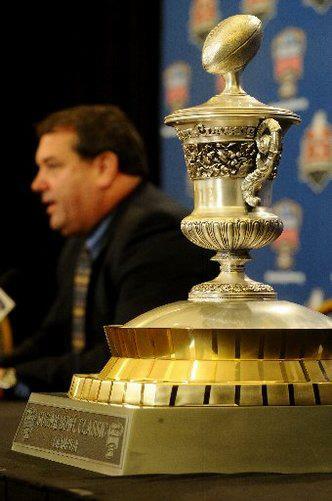 The biggest thing about a bowl, especially a BCS bowl, is that it's on a national stage. But my argument against this game being so important, is that Michigan biggest game of the year was on November 26th, not January 3rd. Hands down. And honestly, I think the 2012 opener against Alabama is going to be a far better judge of this team's overall "back-ness" than a bowl game that essentially exists in a vacuum of time and space. Ohio lost 7 games this year and got handled pretty well in their bowl game against a mediocre Florida team. They also got handed a 1-year post-season ban. Are they gone? Do they need to come "back" in 2013? No, because they're Ohio, and that means that they'll never sink to the level of a Purdue, or an Illinois or a Minnesota. They just won't. They may need to redeem themselves, but no one is going take them lightly. The powerhouses in college football endure because that's just the way it is. Like death and taxes. Michigan was down, but not out. A bowl game is not a great gauge of how good a program/coach/team is. If it were, Bo Schembechler would have been run out of town after his 5th Rose Bowl loss in a row. The point is, no matter what happens in this game tonight, Michigan is still Michigan. VaTech is still VaTech. This game is going to be played and someone will win, but the loser is certainly not down. Both teams got to this game, and means something. Thinking that a team is going to spiral out of control because of a loss in a BCS game is just grasping at straws to find a storyline that really doesn't exist.